Preeclampsia is a complex disease in which several providers should interact continuously and in a coordinated manner to provide proper health care. However, standardizing criteria to treat patients with preeclampsia is problematical and severe flaws have been observed in the management of the disease. This paper describes a set of critical pathways (CPs) designed to provide uniform criteria for clinical decision-making at different levels of care of pregnant patients with preeclampsia or severe preeclampsia. Clinicians and researchers from different countries participated in the construction of the CPs. The CPs were developed using the following steps: a) Definition of the conceptual framework; b) Identification of potential users: primary care physicians and maternal and child health nurses in ambulatory settings; ob/gyn and intensive care physicians in secondary and tertiary care levels. c) Structural development. The CPs address the following care processes: 1. Screening for preeclampsia, risk assessment and classification according to the level of risk. 2. Management of preeclampsia at primary care clinics. 3. Evaluation and management of preeclampsia at secondary and tertiary care hospitals: 4. Criteria for clinical decision-making between conservative management and expedited delivery of patients with severe preeclampsia. Since preeclampsia continues to be one of the primary causes of maternal deaths and morbidity worldwide, the expected impact of these CPs is the contribution to improving health care quality in both developed and developing countries. The CPs are designed to be applied in a complex health care system, where different physicians and health providers at different levels of care should interact continuously and in a coordinated manner to provide care to all preeclamptic women. Although the CPs were developed using evidence-based criteria, they could require careful evaluation and remodelling according to each system's demands. Additionally, the CPs need to be tested in large-scale, multi-level studies in order to thoroughly examine and evaluate their efficacy and effectiveness. Managing preeclampsia remains a challenge for physicians and health care services. Physicians make clinical decisions on an individual basis and combining intuition with concepts of probability, utility and the expected value of decision making. Meanwhile, health care service organizations attempt to meet the health needs of patients by using human and physical resources effectively and efficiently. Approaches to treating hypertensive disorders during pregnancy, such as preeclampsia and its complications, should include both perspectives. First, the team of physicians and other health care providers must consider the well-being and progress of the individual woman and her foetus. Second, institutional settings should establish guidelines for the management of such patients to provide uniform, high quality health services, efficiently and effectively, as well as to ensure to physicians the availability of appropriate resources to manage patients. This balance is complicated since physicians must take into account possible variations in the development and severity of preeclampsia on an individual basis, and because health care services differ in terms of their resources, criteria, and demand for services. Because sub-optimal clinical management of preeclampsia can have serious consequences, a strategy to formulate and to implement clinical practice guidelines must be developed. Previous attempts at developing a "logical stepwise management structure" for treating patients with severe pregnancy-induced hypertension have highlighted the importance of screening all pregnant women and ensuring continuity of care. However, these management structures do not offer guidelines for clinical decision-making based on patient health outcomes. The Canadian Hypertension Society Consensus Conference developed and proposed a complete and comprehensive set of evidence-based recommendations and criteria to define , manage  and treat  hypertensive disorders in pregnancy. The objective of this study was to develop a set of CPs providing uniform criteria for clinical decision-making at different levels of care of gravid patients with preeclampsia or severe preeclampsia. Another objective was to provide a tool that would allow retrospective evaluation of quality of preeclampsia care during the antenatal, intrapartum, and postpartum periods. This endeavour was accomplished with participation of physicians and researchers from the University of Montreal and Laval University (Canada), Magee Women's Research Institute and University of Alabama at Birmingham (USA), and the Mexican Institute of Social Security (Mexico). Main objective of this group was to coordinate efforts to improve management of preeclampsia and its complications. Critical pathways describe the specific responsibilities of health care providers in both ambulatory and hospital settings. They also define modalities which different levels of care should be linked. The proposed CPs include: criteria to screen for hypertension and confirm the diagnosis of preeclampsia; a sequence of steps necessary to manage and provide timely treatment at primary, secondary and tertiary health care facilities; and criteria for referral among these levels of care. a. Definition of the problem. b. Definition of the levels of care (including health personnel responsible) in which the patient may (and should) receive care. c. Review of current published evidence regarding effectiveness of treatment of preeclampsia, severe preeclampsia, and severe morbidity. d. Estimation of expected benefits, harms, and costs. e. Judgment of the relative value of using the CPs. 2. Identification of potential users of the CPs. A group of clinicians – including family physicians, ob/gyns, and internists – among others, participated in the development of the CPs. Internationally-recognized researchers in the field of preeclampsia led this group. A team of health services researchers and epidemiologists constructed the conceptual framework for the CPs. The aim was to engage in an integrative approach in which physicians from different levels of care could provide their insights into the management of preeclampsia and severe preeclampsia. The conceptual framework for the CPs was based on the methodology proposed by the Evidence-Based Care Resource Group  and adapted accordingly. Steps to follow in the CPs are depicted by using flowcharts. The pathways present a comprehensive method that defines which interventions must be performed relative to the health status and level of care provided. , Additionally, pathways present goals for patient progress and provide the optimal sequence and timing of staff actions. On the whole, it is a method of standardizing the diagnosis and treatment of this complex disease, meanwhile allowing the treating physician to respond to an individual patient's progression or complications. The pathways to treat preeclampsia address diverse components, such as: screening, diagnosis, treatment at the different levels of care, medications, monitoring, and criteria for referral and interruption of pregnancy. The group participating in the process considered that the CPs should have three attributes: 1) Clarity: CPs should be easy to follow; 2) Specificity: the CPs should be explicit regarding the management to be provided throughout the process of care; and, 3) Flexibility: when appropriate, to permit different options to be exercised, particularly in situations of uncertainty regarding the optimal therapeutic decision. Each pathway was tailored according to the level of severity of preeclampsia. The resources needed to provide appropriate care were defined. The same criteria should be useful in identifying critical points to be addressed in evaluation of quality maternal care. • Inaccuracy in screening and diagnostic procedures that can lead to misclassification of patients, (i.e. inaccurate diagnosis of the presence/absence of hypertension during pregnancy). • Failures in the process of care, such as, deficiency in the information provided to the patient regarding her disease, untimely referral among the different levels of care, and inappropriate medical treatment. These process failures include delay in the provision of care when the patient is referred from the family medicine clinic, as well as, inaccurate diagnosis or inappropriate treatment during hospitalisation, including the period of labour or delivery. These flaws could worsen patient prognosis and accelerate further complications. • Delay on the part of the patient in seeking prenatal care (only 30 percent of pregnant women consult for prenatal care in the first trimester), lack of compliance to medical recommendations, and irregular attendance at routine prenatal care visits. The CPs were developed in accordance with the different levels of care in which a pregnant woman is seen within the health system of the Mexican Institute of Social Security (IMSS). The IMSS is a three-tiered health care system with an institutionalised referral system. At the primary care level, family physicians and trained nurses provide prenatal care and are responsible for screening, diagnosing and, when needed, referring women with preeclampsia to the next level of care. The secondary care level provides intrapartum and postpartum care to preeclamptic patients referred by the primary care physicians. The majority of referred patients are managed at the secondary level. All deliveries take place in the hospital. According to guidelines, women with severe preeclampsia or secondary severe morbidity receive treatment at tertiary care level hospitals. The expected benefits, as well as harms, were considered according to the different stages of illness and the processes of care of the patient with preeclampsia. The Maternal Mortality Committees of each of the IMSS hospitals have identified serious flaws in the treatment of preeclampsia patients, resulting in severe morbidity and mortality. Given the organization of IMSS constituent services, preeclampsia should most often be identified at primary care (ambulatory) facilities, while treatment should be provided at secondary and tertiary (hospital) levels. One of the most relevant potential benefits of the CPs is the early identification of preeclampsia. Early detection according to standard criteria, will allow timely treatment and management of this disease and facilitate coordination among the levels of care. A primary goal is the reduction in the number of patients who progress to more severe forms of morbidity and death, reducing the burden of maternal morbidity and mortality. From the health services perspective, another benefit is to define reliable criteria for the evaluation of the quality of care provided at the different stages of the disease and types of facilities. Costs must be considered from different perspectives, which include both societal and health services costs. The costs of treatment for preeclampsia and eclampsia within IMSS is difficult to estimate, as all enrolees share the cost because of the institution's principle of solidarity. Available information provides only unit costs. There is very limited data regarding the cost of illness, the years of life lost, or the disability adjusted years of life lost due to preeclampsia, or its complications, including maternal or neonatal deaths. It is safe to assume that the reduction of serious maternal morbidity or mortality by early diagnosis and effective treatments has a high benefits to cost ratio at the societal level. In this initial phase of assessment, is difficult to define the trade-offs that are involved. While evidence-based criteria from published literature contributed to their development, the overall effectiveness of the CPs needs to be evaluated through clinical and field trials. Such testing would address the question regarding the relative value of implementing CPs in institutional health care settings. An added value of the CPs is that they could be used as tools to identify problems in the process of care by comparing actual clinical practices with CP guidelines. Additionally, the preeclampsia CP could be adapted to any similar integrated program providing primary, secondary and tertiary levels of care to pregnant women. The CPs are designed to be used in health care institutions: primary care physicians (either family physicians or general practitioners), and maternal and child health nurses in ambulatory settings; ob/gyns and intensive care physicians in secondary and tertiary care levels. The CPs are designed such that the providers at the next level of care can continue where the previous provider left off. The CP was developed as a comprehensive method of planning, delivering, and monitoring care for patients with preeclampsia and severe preeclampsia. The flowcharts streamline and define delivery of services at the three levels of care. 1. Screening for preeclampsia, risk assessment and classification according to the level of risk. 2. Clinical data that should be taken into account at the first prenatal visit. 3. Confirmation of preeclampsia, based on two criteria: hypertension and proteinuria. 4. 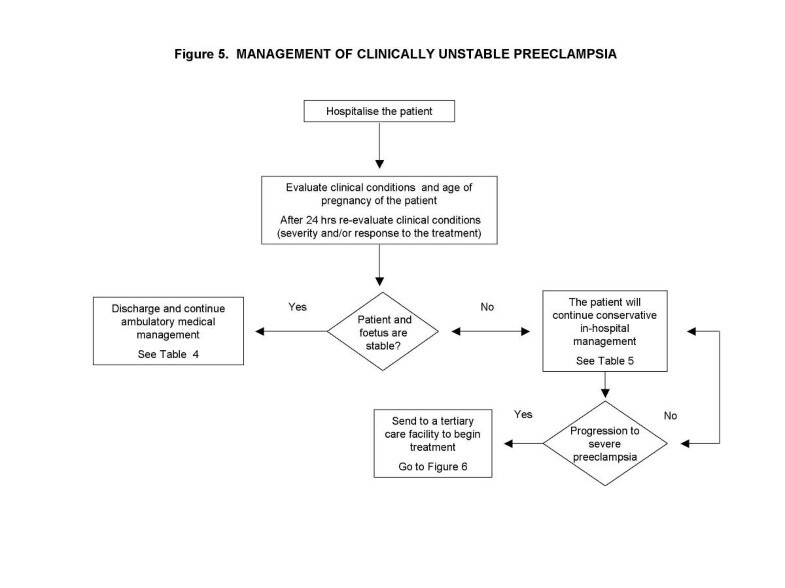 Management of preeclampsia at primary care clinics. 5. Evaluation of preeclampsia at secondary care hospitals. 6. Management of preeclampsia at secondary care hospitals. 7. 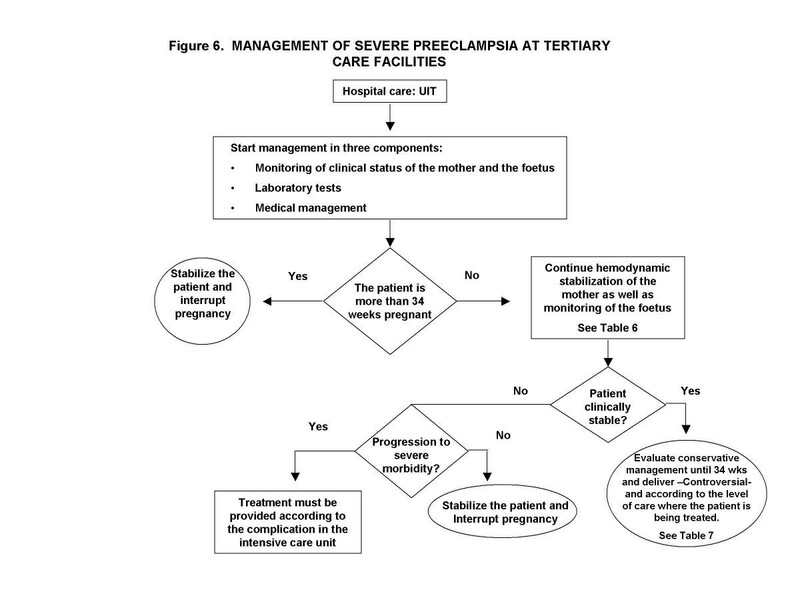 Management of preeclampsia at tertiary care hospitals. 8. Criteria for decision-making between conservative management and expedited delivery of patients with severe preeclampsia. Factors that must be considered at each prenatal care visit First level of care. Responsible: Family Physician and maternal and child health nurse. Please also refer to Figure 1. Measure blood pressure twice on the left arm, using the muffling of the sound (5th Korotkoff). Clinical data First level of care. Responsible: Family Physician and maternal and child health nurse. Please also refer to Figure 1. Identify any other signs of alarm. 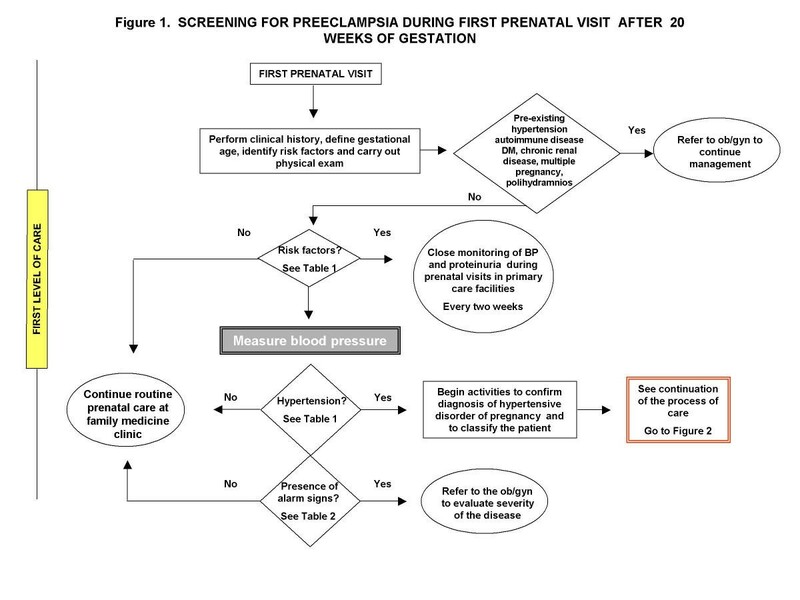 Depending on the results of the process shown in Figure 1, the patient will either, 1) continue routine prenatal care at the primary care level, if she presents none of the signs or symptoms for preeclampsia; 2) continue in the process of care, to confirm and assess the severity of an initial diagnosis of preeclampsia; or 3) be referred to an ob/gyn for management at the secondary level of care, when high-risk status of the patient is confirmed. Confirmation of preeclampsia is based on two main criteria: hypertension (DBP > or = 90 mm Hg) and proteinuria. The definition of hypertension proposed by the Canadian Hypertension Society Consensus Conference , as well as the definition used by the IMSS group, were taken into account. The clinical signs and symptoms specified on Table 1 should be taken into account to diagnose and classify the severity of preeclampsia. If the patient has or develops hypertension, the treating physician should follow the steps shown in Figure 2 to confirm the diagnosis of preeclampsia and to classify the severity of the disease. The physician also needs to pay particular attention to the identification of warning signs (Table 2) that would activate a referral to the next level of care. The goal of management of preeclampsia at primary care clinics  is to consistently monitor the clinical condition (detection of signs of alarm and blood pressure measurement) of the patient and identify, in a timely manner, the need to refer the patient to a higher level of care. Patients with a diagnosis of either preeclampsia or gestational hypertension are referred to the secondary level of care to be clinically evaluated by the obstetrical specialist. 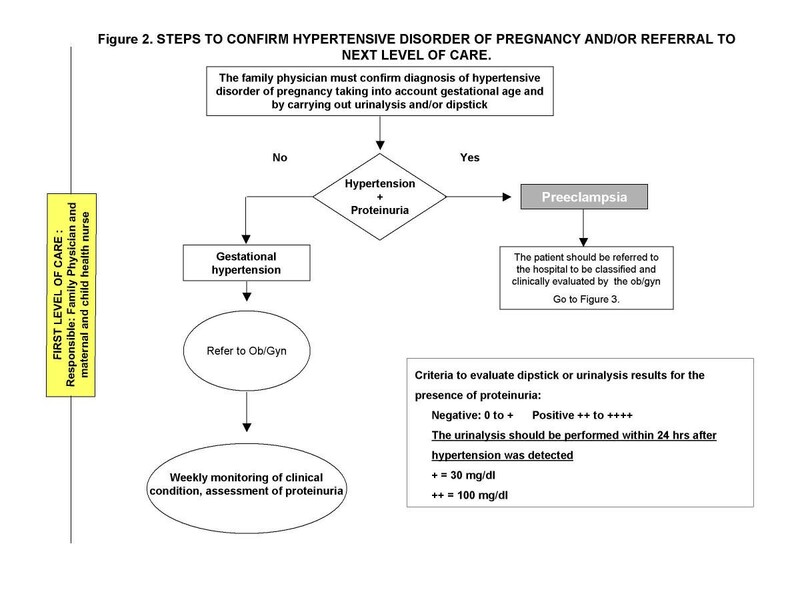 Steps to confirm hypertensive disorder of pregnancy and/or referral to next level of care. 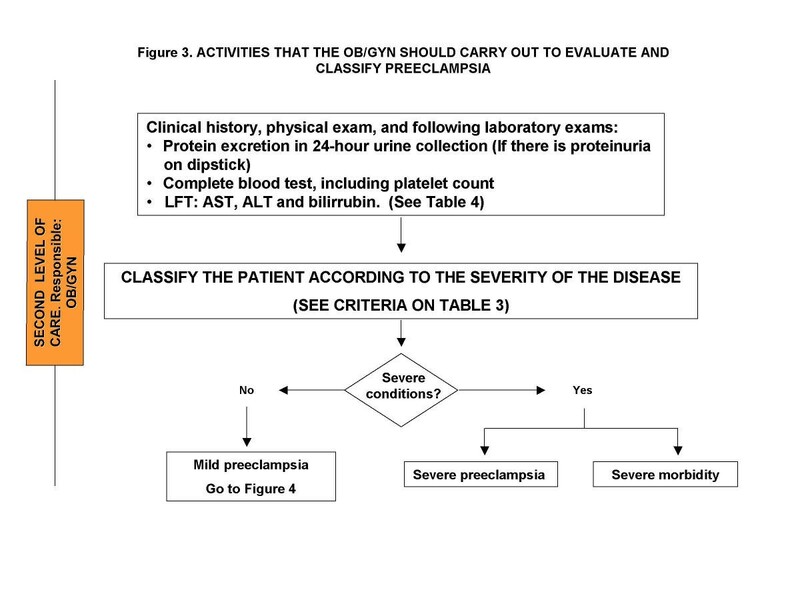 Criteria to classify the hypertensive disorders of pregnancy Second and third levels of care. Responsible: Ob/gyn physician. Please also refer to Figure 3. Ambulatory management of clinically stable preeclampsia at secondary level of care Please also refer to Figures 3, 4, and 5. Monitoring: The patient must be seen every third day until admission for delivery. Induction of pulmonary maturity using dexamethasone or betamethasone in patients with gestational age less than 34 weeks. Hospital management of clinically unstable mild preeclampsia at the secondary level of care Please also refer to Figure 5. Monitoring: The patient must be hospitalised. On the other hand, if the patient and/or foetus remain unstable, she continues in-hospital management. Delivery is performed according to institutional standards. (Table 5) If the disease progresses to severe preeclampsia, she is referred to a tertiary care facility for treatment. Hospital antepartum management of a patient with severe preeclampsia Intensive Care Unit. For stable patients under 34 weeks of gestation. Please also refer to Figure 6. Criteria for expedited delivery and conservative management in patients with severe preeclampsia Please also refer to Figure 6. Patients who have been diagnosed with severe preeclampsia or severe morbidity should receive care at the tertiary level. 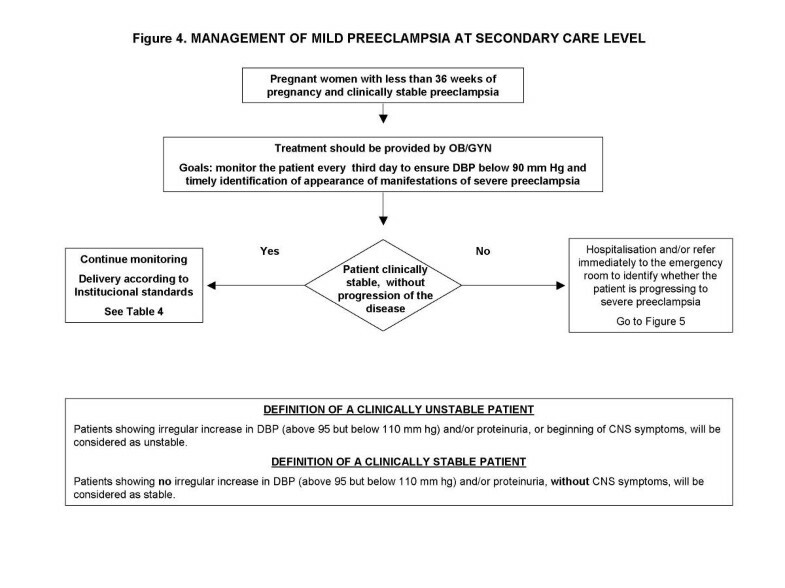 Criteria for decision-making between conservative management ,[31, 32], and expedited delivery of patients with severe preeclampsia are based on the patient's clinical condition. , As Figure 6 shows, management must be focused on three components: 1) monitoring the clinical status of the woman and the foetus; 2) conducting laboratory tests (Table 6); and 3) appropriate obstetrical management. Patients with severe preeclampsia, who are at more than 34 weeks' gestation, should be stabilized and delivered within 24 hours of stabilization. For selected patients without severe morbidity, who are at less than 34 weeks' gestation, expectant management may be considered. Careful stabilization of the woman and thorough monitoring of the foetus should continue. Patients who remain stable may continue with conservative management (Table 7) until 34 weeks of pregnancy, at which time her pregnancy should be interrupted. In developing the CPs, we respected published recommendations regarding the construction of critical pathways. These pathways provide a clear, specific, and flexible set of guidelines for managing preeclampsia and its complications. In addition, the CPs can be employed as a tool to measure performance during the process of care, by physicians who provide care for patients with preeclampsia, or by managers of health care settings. As a result, the CPs provide an optimal design for evaluating quality of care from different perspectives: patient, provider, and manager. The processes described here were constructed for use in a three-tiered institutionalised health care system. Consequently, the CPs would have to be tested for functionality both in IMSS and in other health care systems and could require careful evaluation and remodelling according to each system's demands. A significant variable affecting the potential benefits of the CPs is the role that the patient plays, given that she is the most important beneficiary. In the IMSS health care system, only 30% of patients begin prenatal care during the first trimester of pregnancy. Additionally, there is a low attendance rate for scheduled visits. This includes situations in which patients who are referred to hospital care due to complications of pregnancy, but do not present for as many as three or four weeks. Since preeclampsia continues to be a principal cause of maternal deaths and morbidity worldwide, the expected impact of these CPs is to contribute to improving health care quality in both developed and developing countries. For example, the CPs can be useful in developed countries where health care systems – public and private – are seeking to improve quality of care for patients with preeclampsia and still meet the institution's outcome expectations. As previously mentioned, the CPs also could serve as a process evaluation tool in such settings. Implementing CPs would attenuate the consequences of a high volume of patients on the public health care system, allowing for timely and adequate management of preeclampsia and its complications. By implementing CPs, the health care system in developing countries can provide high quality of care with limited resources and meet its outcome expectations. The impact of implementing CPs may be greater in developing countries where standards of care related to preeclampsia have yet to be applied. Interaction among researchers and expert clinicians from different countries has the potential to expedite technology transfer by increasing the perceived validity of the CP. In addition, the culture surrounding preventive health care is not always favourable for providing patient education. In Mexico, many women wait until the condition worsens to a degree that it interferes with her daily activities, before consulting with health care personnel. This implies that although maternal and child health nurses provide preventive education, patients with preeclampsia arrive with more advanced cases than their North American counterparts, indicative that it is necessary to provide effective management during all stages or phases of preeclampsia. The CPs address risk assessment, early identification of complications and provide guidance not only for physicians, but also for other health providers (such as, maternal-infant health nurses, social workers, midwives) who are responsible for the management of pregnant patients, thus helping them to make timely decisions. The CPs were developed for application in routine provision of care for patients with preeclampsia. Although the CPs are based on evidence-based criteria, they need to be tested in large-scale, multi-level studies in order to thoroughly examine and evaluate their efficacy and effectiveness. Some issues that need further evaluation are: acceptance by physicians; pertinence in different health care settings; convenience as an educational tool to update physicians and health care providers; appropriateness to provide high-quality management; cost-effectiveness; and in the medium and long term, impact in decreasing morbidity and mortality due to hypertensive disorders of pregnancy. We acknowledge and thank all participating clinicians and staff from the IMSS hospitals: Luis Castelazo Ayala Hospital, La Raza Hospital, and Los Venados Hospital. RPC, WF, and JMR coordinated the international working group; RPC, WF, HR, AD, and JMR developed the critical pathways; RPC and HR reviewed the literature and organized meetings with clinicians to review and validate the critical pathways; All authors collaborated with RPC in writing and editing the article. All authors read and approved the final manuscript.